President Buhari vows not to back down on anti-graft war – Royal Times of Nigeria. 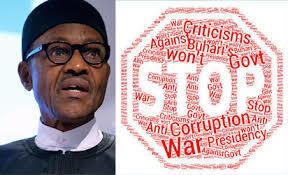 President Muhammadu Buhari has vowed to intensify the ongoing anti-corruption, saying he will not back down despite criticisms from looters. 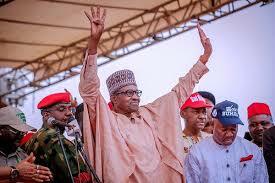 Speaking before a mammoth crowd at the All Progressive Congress (APC) presidential rally in Makurdi, Benue state capital, Buhari said he will expose corrupt elites, recover more money and build roads, railway and power stations to boost the economy. He scored himself high on delivering his electioneering promise of fighting corruption, providing security and improving the economy. On economy, he said he has made fertilizers available to farmers and stopped importation of food thereby providing food security to farmers and Nigerians. APC Leader in the north central and Senator representing Benue North west senatorial zone, George Akume, described Buhari as a selfless leader who refused to enrich himself.